In talking to our tool customers we have heard about a wide range of different woodworking projects. While many people are engaged in making modern and reproduction furniture, others are building boats, musical instruments, barns, music boxes, etc. We are excited to see and hear more about our customers projects, and to provide our customers an international venue in which to display their work. This page is open to all our customers, whatever you make, and whatever your skill level. Simply send us a photograph, via e-mail or conventional mail, along with a short description of the piece and the hand tools you used to make it. You can have your whole name or just your first name appear, along with the state or country in which you live. If you are in business to sell your work, you can put that you are a professional and give your phone number. Everyone is limited to three entries per year. 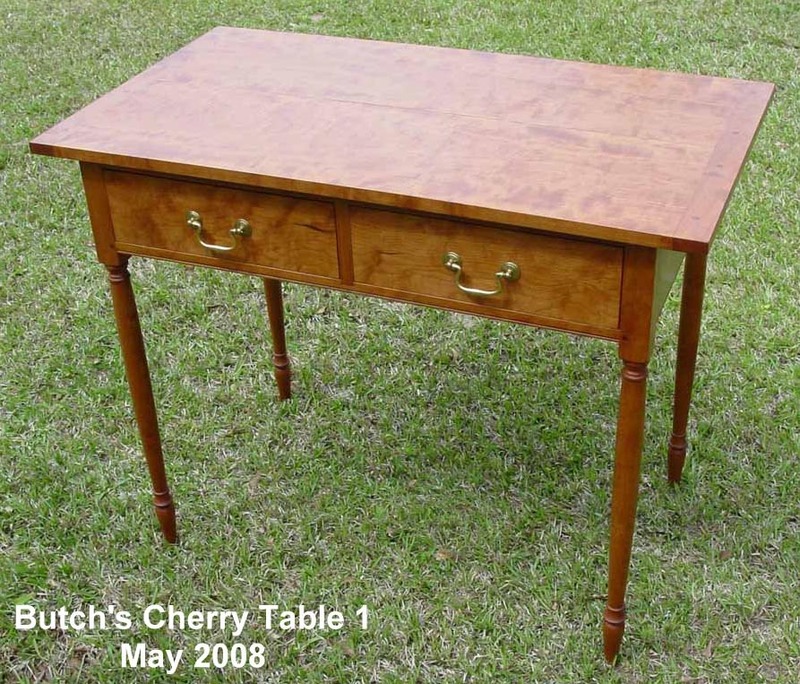 Cherry Work Table. This is a small sewing, or work table, all hand made in American cherry. The design is original but follows early 19th Century American design cues. African Mahogany Blanket chest. 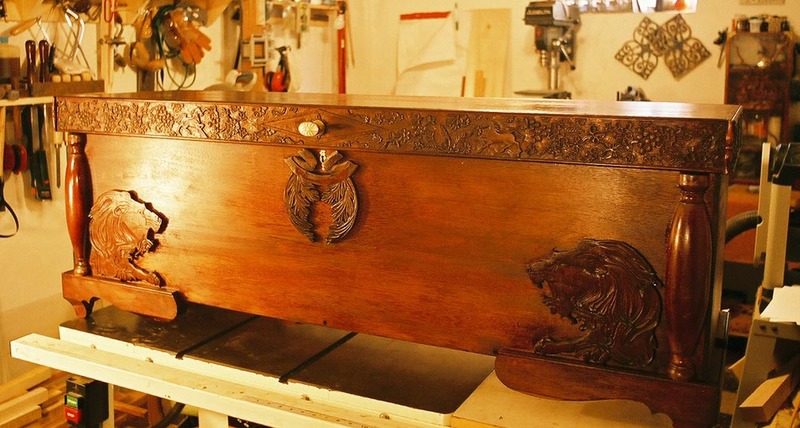 This extraordinary chest was commissioned to be the center peice of a bedroom in a downtown Washington D.C. home. Utilizing Mahogany oil finish this hand carved chest touts a horse and lion theme with a grapes and floral design intermixed and has an aromatic cedar lining. Cherry, oil finish. 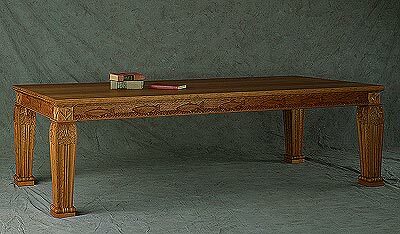 This extraordinary table was commissioned to be the centerpiece of a personal library. An assortment of Brook, Brown and Rainbow trout are carved into the table apron. The trout lay between carved and fabricated moldings suggestive of water movement. 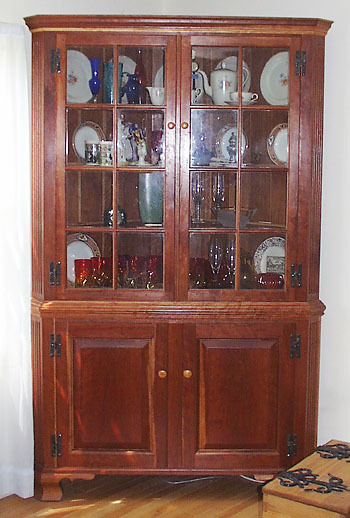 This piece is made from solid cherry and finished with numerous coats of durable oil. It knocks down for transport when necessary. 102" long, 44" wide and 29" tall. The legs for the table are carved from 6" square blanks. The details and mass hold the large table up visually and provide substantial junctions for the apron rails. The unique styling of this piece compliments the surrounding room details and provides a luscious surface to work upon. Oak and Iron. 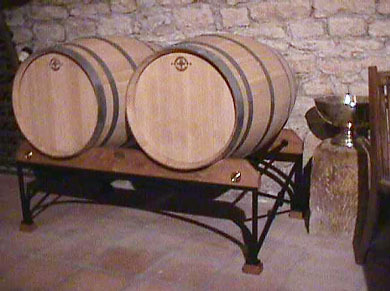 Roger fashioned these barrels and the stand for his parents 15th Century house, on the family's vineyard. 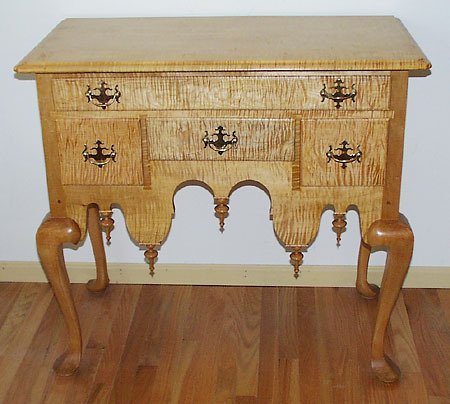 The construction of this piece combined the skills of the cooper, cabinetmaker, and blacksmith, and was done entirely with tnfill plane, and hand scraped. Tiger Maple. This piece borrows design elements from various period examples in the museum catalogs that I rely on for reference. It was made en-suite with a matching chest of drawers. The drops were turned on a Holtzapfel treadle lathe. The drawer edges were formed with a thumbnail molding plane. The tiger maple was smoothed with a British infill plane, and hand scraped. Pine. This is a simple country style shelf of the mid-eighteenth century. It is not based on any particular example, but is representative of the form. The shelves are mortised into the sides. 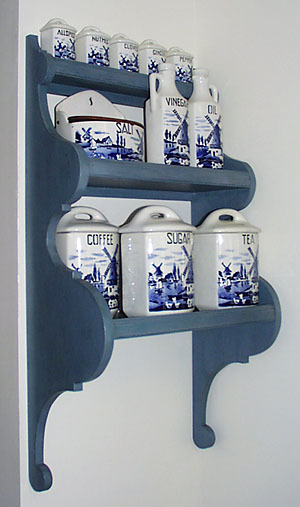 The shelves have a delicate applied molding that forms a lip at the edge. The lower drawer edge has a delicate 1/8" bead. The piece is finished in milk paint with a shellac overcoat. Cherry. This piece, while still a country style, has a number of aesthetic enhancements that makes it more ornate that a typical county piece. It has ogee bracket feet, raised panel doors, and quite fany moldings for the crown and waist moldings. The feet were formed with hollows and rounds. The raised panel doors were cut with a fixed fence American panel raiser. The waist molding was built up using three separate complex molding planes. The crown molding done with a small crown molding plane and one other small complex molder. The glass came out of a derilict 19th Century farm house that I own.